Did y'all read Jessica's other book, Give Them Grace: Dazzling Your Kids With the Love of Jesus? That book daily encouraged me as I read it. I even downloaded the audio book to put on in the car when I needed someone to remind my heart of the importance of my motherhood. I think mom's need two things each day. We need to laugh and we need someone to preach the gospel to us. 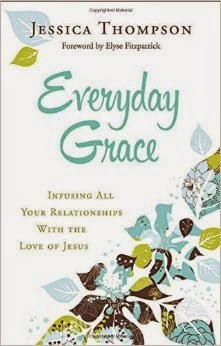 This book took that gospel grace and applied it to all of the other relationships in our lives. I have been asking God to remind me of his gospel in some relationships that I am in. Sometimes, you just want to cut bait and go home if you know what I mean. It is hard to deal with certain personalities and selfishness in the body of Christ. It is difficult to see people wounding one another and even wounding me. There are facades and crippling brokenness to come against. It is tiring to say the least. I need a daily dose of redemption myself and to be reminded to do the difficult work of loving others. Everyday Grace is a beautiful work toward this end. I loved it. The pages are filled with rich quotation, verse after applicable verse, and humble wisdom. It encouraged my heart to pursue deep love in the face of adversity. I thanked God for the work that Jessica has done in these pages. She truly did an excellent (and I am sure a bit inspired) work. I am asking the Holy Spirit to pour the wisdom I read into my heart. We are all equally broken. "Ask him to help you love in the face of opposition. Pray for and seek the Holy Spirit. Pray he will remind you that it is not all up to you. Pray he will give you the right words to say or the ability to be quiet. Pray he will teach you to depend more on his work." This book was graciously provide by Bethany House Publishers for review. Here are a couple of quotes quoted in the book that I posted on Instagram.